Bluetooth is a wireless technology that you can use to connect a keyboard and mouse to your Mac. While WiFi connects the computers and other devices within a home or place of business to create a local-area network, Bluetooth has a much shorter range, about 30 feet. Bluetooth is designed to create a personal network around an individual. Bluetooth can link your Mac to your cell phone and PDA, allowing address book updates to be shared among all devices, a process called synchronizing. Two Bluetooth devices can’t talk with each other until they have been formally introduced, a process called pairing. To pair two Bluetooth devices, you have to get one of them in a special state called discoverable. How this is done differs for each device. In some cases, you press a special button or hold down a regular button longer, or you must navigate through cell phone menus. The details are in each device’s manual. Never throw out the instruction booklet that comes with a Bluetooth device. If you do lose the booklet, check the manufacturer’s Web site. Most have instructions online for recent models. 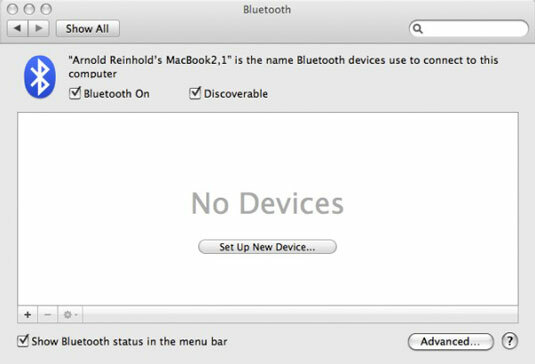 You configure Bluetooth by clicking the Bluetooth icon at the top of your Mac’s screen. The list you see includes options to turn Bluetooth on and off, make your Mac discoverable by other Bluetooth devices, and browse for files on Bluetooth devices. You can also open the Bluetooth preferences screen, which is also available from System Preferences.